Now in the Best of Eleuthera series I want to tell you about the adventures of the Antiki raft. Those of you who have visited Governors Harbour will probably have seen the raft moored up here in the harbour – but you may not be aware of the story of how it came to be here. In 2011, led by Anthony Smith aged 84 ! – the raft left the Canary Islands off the coast of Africa and set sail across the Atlantic. Anthony’s dream was to re-create the voyage of the Jolly Boat – a life boat which drifted across the Atlantic during the Second World War after the boat that it’s sailors were on was shelled and sunk. 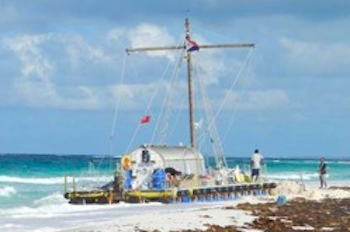 The Jolly Boat washed up finally on the shores of Eleuthera after 77 days at sea- between Airport Beach and James Cistern and there were only 2 remaining survivors out of the original 7. Anthony – an incorrigible adventurer was so inspired by this story that he had decided to re-create the voyage. He sailed across the Atlantic for 66 days with his crew of 3 others – they had a combined age of 259 !! – eventually they landed in St Maarten in the southern Caribbean after having drifted off course – obviously at the mercy of the currents. Can you imagine being crammed in here with 3 or 4 other people for a couple of months ? !!! They had a wonderful welcome there and after a while they all flew back to the UK. But of course Anthony was not going to give up. So the next year – with a different crew totaling five – they set off from St Maarten to finish the journey and land in Eleuthera. They left on April 6th 2012 and finally approached the coast of Eleuthera on the stormy night of April 29th. Amazingly they landed very close to the original site where the Jolly Boat was washed up seventy two year before. Around midnight the sea anchor line snapped and Antiki bumped and scraped over the reef until finally drifting onto the beach during a lull in the storm. The crew made it to shore – including the now 86 year old Anthony – who was helped off by Ricardo Knowles and my husband Bob Colman – by this time after 23 days on board he could not walk – let alone jump down and wade ashore. They secured the raft for the night and returned the next day to survey just how close they were to the original landing site. By May 8th 2012 Antiki had been towed right around the top of the island and down into Governors Harbour where it is still moored. It rode out Hurricane Sandy in late October 2012 without so much as a murmur but in February 2015 it broke it’s mooring and was washed ashore in the harbor during a heavy storm. Repairs have been carried out to the raft during the 3 years it has been here but it still is in great condition. There are plans in the offing for it to be used for short tourist cruises around the Governors Harbour area. Anthony Smith died on 7th July 2014 but his book – The Old Man and the Sea – is now available on Amazon. It is his full story of the Antiki adventure – from start to finish. We will be donating a copy to the Haynes Library. He was a remarkable English eccentric – sadly a dying breed – we were lucky to have met him and become a small part of his extraordinary adventure. Do check out the link to the Antiki blog for the trips and click on the Anthony Smith link to read his own words about himself and his life……. Stuart and I loved reading about his adventures! What a man and crew…lucky you. yes – one of those people that your life is richer for having met…..